I’ve been thinking about Sheri Sinykin’s recent book, Zayde Comes to live and why it resonates with me so. Zayde is a picture book about a little girl trying to understand what will happen to her grandfather after he dies. In turn, Zayde got me thinking about Kevin Henkes’ book, Wemberly Worried. On the surface one would think these two books don’t have much in common: a book about death and a book about worry. For me, though, they have everything to do with each other. Let me start with a true story. When I was nine-years-old, my father died quite suddenly of a heart attack. I became terrified my mother was going to die next. That she had chronic heart palpitations that caused her to think she was dying did not help. For about two years after Dad’s death, if Mom happened to be sleeping when I was awake, I would get so agitated that I’d check to make sure she was still alive. Many times I woke her up just to be sure. Many years ago, I had the good fortune to attend a presentation by Kevin Henkes. He showed slides of his work-in-progress at that time: Wemberly Worried. When he shared with us how he worried about everything as a child, it was easy for me to empathize. But one scene in Wemberly that Henkes projected on the screen caused such an emotional reaction in me, I found myself weeping. Wemberly, the tiny mouse who is the protagonist of the story, takes a flashlight and checks up on her parents while they are sleeping to “…make sure you were still here.” For that moment, in that hall, I was that nine-year-old child who insisted on waking her mother in order to confirm she was still alive. During a more recent presentation, titled “An Equivalent Happiness: Making it Out of Childhood,” Kevin Henkes stressed the obvious: that childhood is not by any means all fun and games. Most people remember a fair amount of hurt from their childhoods. But we are creatures of hope, and that hope carries us through to believe that sometime in the future, our unhappy days will even out with happy ones, thus the equivalent happiness. Both Sinykin and Henkes understand and remember those fears and difficult times from childhood. These two talented writers bring a rich resource of literature to children’s lives. When the adult reader first sits down to read Wemberly Worried, she may not be thinking about how hard it is just to grow up. Wemberly, a child that worries “too much,” may seem like an anomaly. Isn’t childhood supposed to be carefree? But the adult reading this book will soon be reminded that, from a child’s point of view, the world is a new place, full of uncharted and scary experiences. A toddler dares to explore just beyond the reach of Mama, but quickly returns to her loving arms. A kindergartener fears the first day of school. An older child ponders what death means. Making it out of childhood isn’t easy. With books and authors like Sinykin and Henkes we can help our children on their way. And as adults, we will never tire of reading their books to our little ones because they resonate so much with our own lives. 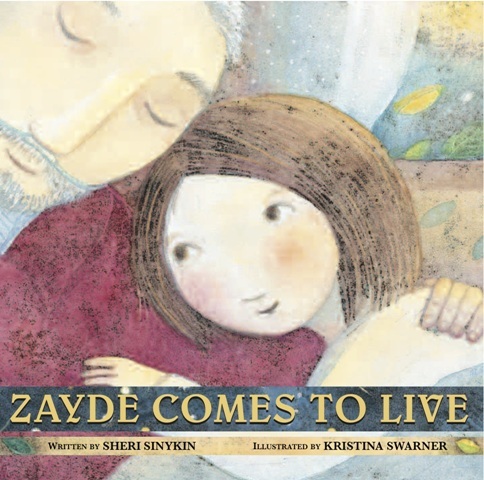 Zayde Comes to Live by Sheri Sinykin, illustrated by Kristina Swarner. Peachtree Publishers, Atlanta, GA, 2012. Sinykin communicates her message with gentle care. She stresses this is not a book to simply hand off to a child. Rather it should be read by an adult at the right time in a child’s life when the need arises. Kristina Swarner’s illustrations created in linoleum prints with watercolor and colored pencil have a dream-like quality that perfectly complement Sinykin’s spare prose. Wemberly Worried, written and illustrated by Kevin Henkes. Greenwillow Books, Harper Collins Publisher, New York, NY, 2000. This picture book hits all the right notes with its simple portrayal of one of the most common fears of young children: starting school for the first time. Henke’s watercolor illustrations, so simple and yet so evocative, complement the text. Black ink inscriptions, apart from the text, further communicate different characters feelings and comments. Whether starting pre-school, kindergarten or first grade, this is the perfect book for what can be a very scary time in a young child’s life. I know I can remember fears from childhood. The reasons might seem silly now but they were very real back then. 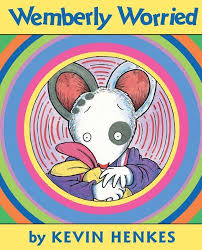 I used to read Wemberly Worried to my children when they were young and always loved it. Great post! Thank you for your eloquent pairing of ZAYDE with WEMBERLY. Your care. love, and respect for our audience resonates in this review. Thanks so much to both of you for your generous comments.